"The degree to which this President continues to take steps to go to war against Iran without consulting with the full Congress is the degree to which he is increasingly putting himself in jeopardy of an impeachment proceeding." The United States Institute of Peace was created during the Reagan administration, but the new agency was not really a center for peace-making. Instead, the usual entourage of Washington insiders from the military-industrial complex populate this agency's board and staff - disarmament advocates do not run the "Peace" institute, although a couple of token moderate peace advocates are on the board along with a diverse assortment of militarists. In these Orwellian days, government agencies that use the word "Peace" rarely mean what they say. Dennis Kucinich was asked about this problem at a 2003 campaign stop, and declined to give a specific response. Perhaps he has an answer now. A cabinet level Department of Peace would be a great thing, but without a substantial shift in policy among the overt (President / Congress / Judiciary) and covert (military, intelligence, corporate, financial) governments, a new addition to the bureaucratic organizational chart is unlikely to accomplish much. Representative Kucinich has pledged to uphold Roe v. Wade and to only select Supreme Court Justices who support this. He's the only Democratic candidate promising to sign the Kyoto Treaty. He's the only candidate who has mentioned the fraud of electronic touch screen ballot machines, for repealing Bush's military budget increases, for a South Africa style "truth and reconciliation" commission to investigate 9/11, and to compensate Iraqi victims of our invasion (something Martin Luther King recommended for the Vietnamese), part of a broader effort to withdraw from that country. Here is Kucinich's exit strategy from Iraq. It is profoundly different from every other Democratic candidate (except Rev. Sharpton), they support keeping the occupation of Iraq going indefinitely. Representative Dennis Kucinich (D-Ohio) on the Diebold "voting machines"
The following is a transcript of his speech and the Q&A session that came after. Roughly 2/3 of Americans cannot name a single Democratic presidential candidate. Only one candidate for President voted against the misnamed "Patriot Act." Only one candidate plans to introduce legislation in Congress to repeal the "Patriot Act." Only one candidate has declared without hesitation that he will vote against the Bush request for $87 billion in additional funds to continue the quagmire in Iraq. Only one candidate has submitted a bill to Congress that would establish genuinely universal health coverage -- nonprofit national health insurance for all. Only one candidate will withdraw from corporate trade deals like NAFTA and the WTO, and replace them with fair trade agreements that include labor and environmental protections. Only one candidate has a plan to cut the bloated military budget by 15% ($60 billion annually) and invest those funds in universal child care. Only one candidate sued George Bush to stop him from going to war in Iraq without a Congressional Declaration of War. Only one candidate led opposition in Congress to the War in Iraq. Only one candidate has a plan to repeal Bush's tax cuts for the wealthiest Americans and invest that money in a plan for universal public education, age 3-college. Only one candidate has pledged to break up corporate monopolies in agriculture, energy, media and other sectors that are strangling farmers, the environment and the public. Only one candidate has pledged to not only sign the Kyoto Treaty on global warming, but to lead our country to 20% renewable energy by the year 2010. Only one candidate risked his political career by standing up to banks and a private utility company to save public electric power. Only one candidate has spoken out against the takeover of our water supply by large multinational corporations. Only one candidate has sponsored legislation establishing a cabinet-level Department of Peace to participate in policy discussions alongside representatives of the Departments of State and Defense. Only one candidate has a 98% lifetime pro-union voting record -- highest of all candidates as ranked by the AFL-CIO. Only one candidate is calling for "living wages," not just minimum wages. Only one candidate has a plan to put Americans back to work with major investment programs to rebuild schools, roads, bridges, ports, sewage, water and environmental systems. returning the Social Security retirement age to 65. Only one candidate has introduced legislation to repeal the Federal death penalty. Only one candidate has been endorsed by Willie Nelson, Ani DiFranco, Studs Terkel, Ed Asner, Hector Elizondo, Barbara Ehrenreich, Arun Gandhi, Ben Cohen (of Ben and Jerry's) and Granny D (who walked across the country for campaign reform at age 89). One and only one candidate has taken the above positions. It may not be who you think it is. You may not have heard much about him. His name is Dennis Kucinich, co-chair of the Congressional Progressive Caucus. Subject: Are the Polls Wrong About Kucinich? From: "David Swanson, Kucinich Campaign"
ARE THE POLLS WRONG ABOUT KUCINICH? That's the headline of an article at Utne.com that shows that the www.kucinich.us website is the second most read presidential campaign site, and which presents other reasons to believe Kucinich's low ranking in some polls is misleading. <http://www.utne.com/web_special/web_specials_2003-12/articles/11008-1.html> Here's the article. Yesterday, www.kucinich.us disappeared from Google and other search engines. We have reason to believe that someone sent very numerous requests to search engines requesting that the site be listed (which it already was), and that as a result it was removed. Google considers programs that submit to hundreds of search engines at once as spam and removes sites using these tools from its indexes. It's unlikely but conceivable that this was even done by an overzealous supporter. The last thing you should do is contact the search engines. We're doing so. But you should do this right away: put a link to www.kucinich.us on any website you control, and make the link use the words "Kucinich for President," and put the www.kucinich.us address in the signature of your Emails. Despite this setback, the site had its biggest day ever yesterday, so this is no time to get disheartened! The Democratic caucuses and primaries are the time to support the candidate who has the best chance of defeating George W. Bush. Clearly, that candidate is Dennis Kucinich. The primaries are not the time for supporting the candidate who you think has the best chance of winning the primaries. That's exactly as useful as staying home. Why is Dennis the one to beat Bush? 1.-Dennis' platform fits his record. He opposes the "PATRIOT Act" now, and is the only candidate who voted against it. He opposes the war now, and is the only candidate who voted against it or who opposed it from the start. And he is the only one who will bring our troops home in 90 days. 3.-Dennis and most Americans want single-payer universal health coverage. President Bush and most other candidates want to keep the HMOs and private insurance companies in charge. 4.-Dennis is the only candidate with a plan to end NAFTA and withdraw from the WTO, replacing these corporate trade agreements with fair bilateral trade based on workers' rights, human rights, and the environment. The other candidates side with the current President in wanting to maintain NAFTA and the WTO. 5.-Dennis has a history of attracting swing voters and "Reagan Democrats" in winning elections against better-funded Republican opponents, it is Dennis Kucinich. He has repeatedly defeated entrenched incumbents. He beat a Republican incumbent for mayor in 1977, for state senator in 1994 (overcoming the national right-wing tide) and for Congress in 1996. 6.-Dennis' Congressional district includes the suburb of Parma, Ohio, described as "one of the original homes of the Reagan Democrats." An Ohio daily calls it a "conservative Democratic district," which he carried by 74% in 2002. Being a success there may be a better predictor of national success than holding statewide office in a liberal stronghold like Vermont or Massachusetts. 7.-Dennis, unlike some other candidates, opposes the death penalty, will end the war on drugs, supports the Kyoto treaty, will take us to 20 percent renewable energy by 2010, and will back no justice who will not uphold Roe v. Wade. 8.-Dennis attracts third party voters and Ralph Nader supporters. 9.-Ohio has 20 electoral votes. It is the state that is key to national victory; only two candidates in the 20th century have won the presidency without carrying Ohio. Dennis Kucinich cannot get a break from big media. Akron's Ray C. Bliss Institute. the "fringe candidate" or the "long-shot candidate." Kucinich's candidacy has been particularly evident in recent weeks. irregularities in the certifying of the company's systems for elections. the controversial documents on his congressional Web site. irregularities caused by the voting machines can be recovered." indicating that they wanted to date him. against Diebold barely gets notice. For the past year I have led the effort in the House of Representatives to challenge the Administration's march to war in Iraq. I have used my voice and my vote to try to help avert the tragedy of this immense diplomatic failure and this departure from morality in world affairs. I have used every legal and legislative resource available to me to challenge this war. This culminated in 126 Democrats, nearly two thirds of the Democratic caucus, voting against the Iraq resolution last October. Yet the war begins. This a sad day for America, the world community and the people of Iraq. Today we hope and pray for the safe return of our troops and the end to this unjustified war. I support the brave young men and women who are following orders that have placed them in harmâs way. While I support the troops, I cannot support this mission. President Bush has launched an unprovoked attack against another country. Iraq does not pose an imminent threat to the United States or any of its neighboring nations. Dark clouds have gathered over the political horizon. This Administration has assumed an aggressive, ideological policy approach which calls for America to be the first to attack. These are offensive not defensive attacks and are in contempt of international law. This is a radical and extreme policy which departs from a national security policy which has helped America guide its way through the nuclear age and the cold war. Containment and deterrence have worked well throughout the last 50 years. They have helped America to negotiate a balancing of power in a world were 16 nations have or are trying to acquire nuclear technologies, 19 nations have or are trying to acquire biological weapons, 25 chemical weapons and 16 with missile technologies to deliver the weapons. In such a complex and even dangerous world, strategies for preemption carry with it the risk of unleashing war around the world. A preference for confrontation instead of cooperation can lead only to disaster. Yet the Administrationâs National Security strategy, of which this attack on the Iraq is the auspicious beginning, spawns unilateral military action, preemption, cancellation of treaties, refusal to participate in treaties, using force to initiate regime change, assassination policies, and seizure of resources (such as oil) of conquered nations This approach to international relations will not eliminate threats to the United States. It will increase anger and hostility towards our nation. The policies imply that only the United States knows what is best for the world and the United States will act without consideration of our friends and allies and international law. As we go it alone in the world, we will be left alone in the world, to pay the price of security alone and suffer the insecurities alone. America is losing its way at home and in the world. We have no money to rebuild America's cities, but we have money to blow up cities in Iraq. No money to feed the hungry, the clothe the naked, to shelter the homeless in America, put money to rain death, destruction, and starvation on Iraq. No money to build bridges over the Cuyahoga River in Cleveland, but money to blow up the bridges over the Tigris and the Euphrates. We have a right to defend ourselves, but America is launching a pre-emptive, unilateral attack on a nation which has not attacked us and does not represent an imminent threat. Iraq was not responsible for 911. Iraq has not been credibly linked to Al Queda and 911. The question is not whether Saddam Hussein is moral. We know the answer to that. The question we face is whether our own nation will lose its moral authority in the world. We stand ready to send thousands of rockets into Iraq to destroy lives, families, houses, buildings, water systems, electric systems, to light fires to force populations to move, to engage in house to house combat. All in the name of fighting terrorism. In the name of removing weapons of mass destruction. "Somehow this madness must cease" said Dr. Martin Luther King Jr. thirty five years ago as he spoke out against the war in Vietnam. "I speak for those whose land is being laid waste, whose homes are being destroyed, whose culture is being subverted·. I speak for the poor of America who are paying the double price of smashed hopes at home, and death and corruption in Vietnam." Once again the hopes of people of two nations are being smashed by weapons in the name of eliminating weapons. Let us abolish weapons of mass destruction at home. I am from the inner city. I have inspected these weapons. Joblessness is a weapon of mass destruction. Poverty is a weapon of mass destruction. Hunger is a weapon of mass destruction. Poor health care is a weapon of mass destruction. Poor education is a weapon of mass destruction. Discrimination is a weapon of mass destruction. Let us abolish such weapons of mass destruction here at home. Eight and a half million Americans are unemployed. Bankruptcies are up. The number of uninsured without health care is up. The price of prescription drugs is up. Poverty is up. Crime is up. Homelessness is up. Hopelessness is up. Fear is up. Let us use the trillion dollars which some would cast upon Iraq in bombs and warring troops, instead for the restoration of the American dream, to rebuild our economy, to rebuild our cities and to expand opportunities for all. Those who say we can have guns and butter do not know the cost of guns and do not know the bread you would put your butter on is being stolen. America may spend over a trillion dollars for war in Iraq. America can give a trillion dollar tax cut to the rich, spend a trillion dollars to put weapons in space, but not a dime more for temporary assistance to needy families. It is time to say stop this war. It is time to recognize that the terror we visit on the people of Iraq will bring terror to our own people. Bring our troops home. Come home America. Come home and fix your broken streets and mend your broken dreams. Come home and rebuild your cities and create full employment, put millions who are unemployed back to work. Come home and establish a living wage, let workers' share the wealth they create. Come home and provide affordable housing. Come home and provide single payer, guaranteed health care for the forty one million Americans who suffer illness with no relief. Come home America. Come home and provide free public college for all who aspire to attend. Come home and act affirmatively to make sure that all opportunities are afforded to all Americans. Twenty five percent of the opportunities to serve in the Army are afforded to African Americans. Our civilian life should offer opportunities as well. America! Come home and provide guaranteed social security for generations to come without privatization and without extending the retirement age which would be devastating for minorities. Come home, America and end racial profiling. Come home and fix your voting machines, restore both voting rights and your democracy. Come home and replace those civil rights lost to the Patriot Act. Come home and make non-violence an organizing principle within our society through the creation of a Department of Peace. America! America! Stay the hand that would drop the bomb and extend the hand that grants mercy to innocent people abroad and to your own people here at home. "Come my friends, 'tis not too late to seek a newer world," said the poet. If America is to remain a leader and promoter of democracy in the world, we must lead the rest of the world to find diplomatic solutions to our problems. We cannot set a doctrine of preemption for our country and then expect other countries will not do the same. We must work to protect Americans, and our way of life, and work with people around the world without going to war. It is not too late. It is time to rally Americans to the cause of peace. "We must see that peace represents a sweeter music, a cosmic melody, that is far superior to the discords of war," said Dr. King. We must not be the first to attack others. The United States can be first in peace through international cooperation. Working for peace in a complex time requires strength, wisdom and courage. I believe the American people are people of strength, wisdom and courage. They have a right to expect their government to be truly representative! Let us rally all Americans to the cause of peace and justice. It is time to make the peace movement and the movement for social and economic justice one. It is time to move away from war as an instrument of policy and move toward a higher plane where peace is inevitable because we will it, want it, and work for it with our hearts and with our souls. When George F. Will [op-ed, May 6] dismissed Rep. Dennis J. Kucinich (D-Ohio) as "the only presidential candidate to have presided over the bankruptcy of a major American city," he not only was factually wrong -- Cleveland defaulted on bank loans but was not bankrupt -- he dismissed 25 years of history and much scrutiny of that event. Cleveland-area voters keep reelecting Rep. Kucinich to Congress because they know that by defending the city-owned power company, their former mayor saved them millions on their electric bills. Rep. Kucinich was elected Cleveland's mayor on a pledge not to sell Muny Light to a private utility. He held to that pledge. His campaign symbol in five winning elections since 1994 has been a light bulb. Further, in 1998 the Cleveland City Council commended Rep. Kucinich for "having the courage and foresight to refuse to sell the city's municipal electric system." Every human being has the right to clean water. In the United States, water has long been considered a vital resource and thus managed in the public interest by local governments accountable to their constituents. The mission of a public water system is simple: Deliver safe, clean and affordable water to you and your family. Public works projects funded and built our existing water infrastructure, which has served us well during the last century. But our water infrastructure is beginning to show signs of age. Pollution, decaying pipes, depleted aquifers and other problems pose real threats to the U.S. water supply and communities across the nation are looking for ways to bring water systems up to safe and modern standards. Privatizing water systems, however, is not the answer. Private companies, seeking to extract profits from municipal water systems, dangle lofty promises in order to gain control of local water systems. Corporations want people to believe that only they can efficiently manage water systems. They seek monopoly contracts to run water systems for generations, or to expand the outright corporate ownership of water supplies and infrastructure. Yet, from Atlanta to the United Kingdom to Huber Heights, Ohio, private water providers have charged higher rates, deteriorated water quality and failed to make assured investments. In fact, privatization failed so miserably in Atlanta that the city ousted United Water, only four years into a 20-year contract. Four years of broken promises and managerial debacles was more than enough. Residents in many California communities are increasingly concerned with local water systems falling into the hands of a distant corporation. In Stockton, where city officials recently voted to privatize the public water system, citizens are responding by going door-to-door to collect signatures in an effort to nullify the City Council's decision. I strongly believe that public control and public administration of the public's water supply is the only way to guarantee the universal human right of access to clean water. A grassroots movement of people is working to protect water from privatization by offering many alternative solutions to solve the global water crisis. Direct citizen participation should be encouraged when basic services such as water are being discussed. I hope that at the World Water Forum, which begins Sunday in Kyoto, Japan, this international movement of people will be heard. 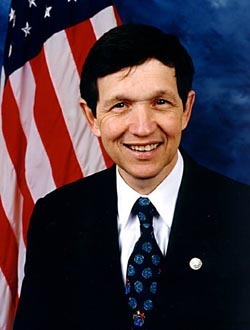 Rep. Dennis Kucinich, D-Ohio, is the ranking member of the House National Security, Veterans Affairs and International Relations Subcommittee. For information on the World Water Forum, see <http://www.world.water-forum3.com>www.world.water-forum3.com.